The odds are that every day, seven days a week, fifty-two weeks a year, someone in Hamilton is taking a chance on provincially-sponsored lotteries, on sporting events like football and hockey, on video game terminals, or on other gambling activities, both legal and illegal. The Ontario Lottery and Gaming Corporation, in its 2012 Strategic Vision document,1 estimated that OLG contributed between 1.7 and 2 BILLION dollars annually to the public coffers of the government of Ontario. Clearly the chances of winning in most OLG sponsored lotteries and games are not very high, since so much money accrues to the government, even after all the winners have been paid. And who knows how much money goes into illegal gambling? 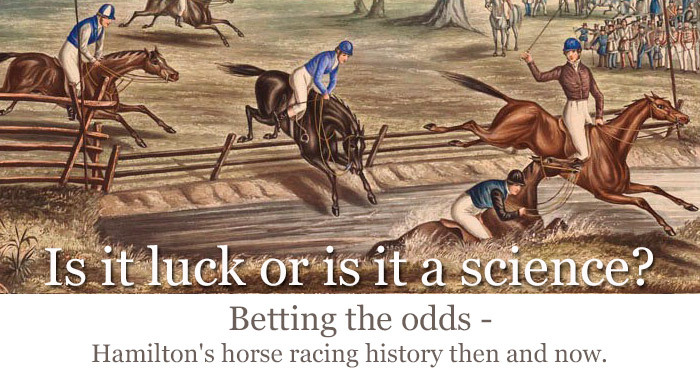 Surely, though, one might ask, if horse racing is different. Whether the sport is thoroughbred, standard bred, or quarter horse racing,2 the bettor can size up the odds, learn all about the pedigree, past record, and experience of the horses and the jockeys who ride them, or the harness driver who guides them, using various websites, magazines such as Trot3 or the daily racing form sheets. Would that it was so easy - since the tracks can adjust the odds in their favour as every race gets closer, and as it adjusts the betting line according to the bets laid down. 1. This report was accessed online at http://www.olg.ca/assets/documents/media/strategic_business_review2012.pdf. 2. The various racing industries in Ontario are allied into the Ontario Horse Racing Industry Association (OHRIA), on whose website can be found a great deal about the recent history of the sport. For further reference, see http://value4money.ca/industry-links/. 3. See for example http://www.standardbredcanada.ca/racing or http://www.cthsnational.com/. Trot Magazine is the official publication of Standardbred Canada, and features in-depth stories of the people and horses making headlines in the world of harness racing.